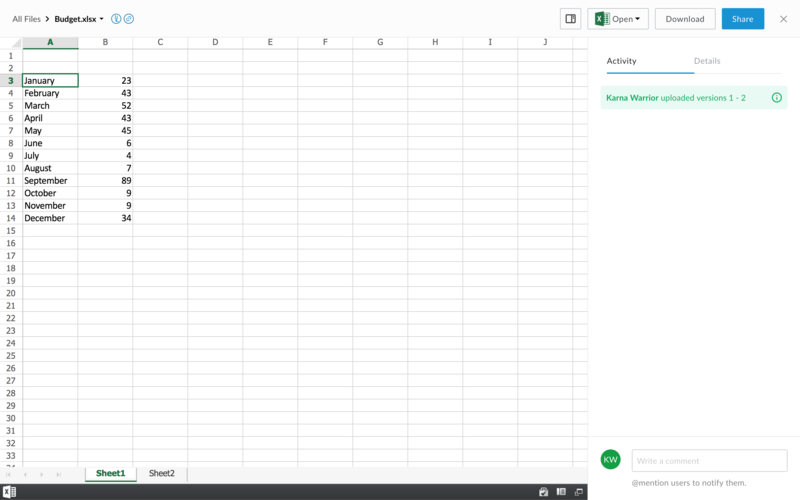 When previewing Excel files in Box, users can make use of the Excel Online Previewer, which leverages Microsoft technology to bring you an enhanced spreadsheet viewing experience. This is a free service and is available for any customer using the new Box web interface. This page refers to the new Box experience. In Box, hover over a single file or folder with your mouse. If the item looks like the following image, you are in the right place. If the item does not look like the image above, this feature is not available. When you preview a spreadsheet using the Excel Online Previewer, the file is sent via secure and encrypted HTTPS to Microsoft servers for rendering. Microsoft caches the file on their servers for 30 days. For reference, here are the Microsoft Terms of Service. Simply click an Excel document to preview it. Depending on your enterprise's settings, you may be prompted to use the Excel Online Previewer the first time you use it. If you've dismissed the prompt but want to add the feature later, or if you've added the feature and want to remove it, you can do so here: https://cloud.app.box.com/services/box_excel_online_previewer. Depending on the size of the Excel file, it may take some time for your spreadsheet to load. The Excel Online Previewer is more powerful than the standard preview experience. You can select individual cells in your spreadsheet, filter cells, and navigate multiple sheets. All the standard features of the preview window are the same as usual. You must have "Download" permissions to use the Excel Online Previewer to view a file. If your access level is Previewer, Uploader, or Previewer Uploader, you will not be able to use the Excel Online Previewer. Click here for more info on Access Levels. Password Protected Excel documents cannot be previewed. Admins can enable or disable the integration directly from their Box Admin Console, in Enterprise Settings:, under the Apps tab. Under Individual Application Controls, you can enable or disable any application or integration for your enterprise. Simply search for "Box Excel Online Previewer" using the Search Box, and select disable. If you select Available, your users will have to add the integration themselves from the Box app store. If you select Added by Default, the integration will be added to their accounts without your users needing to add it manually. To disable the integration, un-check the box marked Enable Box Excel Online previewer. Users will only be able to use the standard preview experience. If both boxes are checked (including Set application as the default Excel preview experience), all end users will automatically use the Excel Online previewer by default. Users will not see the choice dialog above. Note: If you have disabled all published apps by default for your enterprise, none of these options will be checked by default. The integration will be disabled at launch until you take action to enable it.